Since it is school holidays here, I made this snack for Nikolai to have at a friends house. There is also a thermos bento lunch from last week that I am posting below. Bagel and cream cheese basket with egg shaped cheddar and mozzarella cheese. Frozen organic peas which will be thawed by snack time and couple of cherry tomatoes. Leftover lasagna from dinner in thermos. Here are the supplies or similar that I used to make and pack this snack and lunch. So cute! 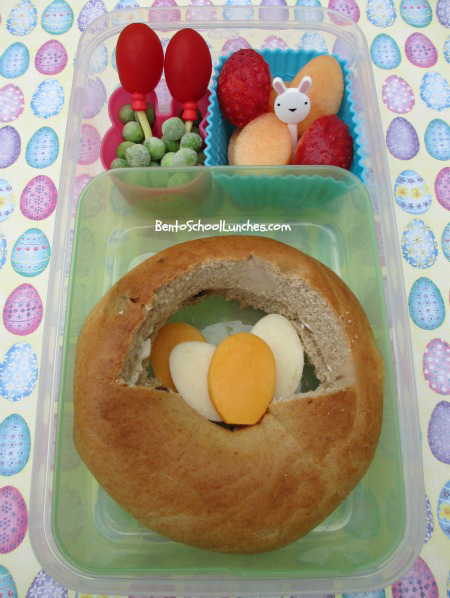 Love the basket done with a bagel! Thanks bentodays and glad that you love the basket, it was the easiest basket that I ever made! I love your Easter basket! Thanks so much Kathy and happy to know that you like it! Wow, love the basket, so creative!